Rahm Emanuel: Can You Guys Do Me A Solid? Capitol Fax has pulled a pretty significant development out of a Sun-Times piece that says Rahm Emanuel had a meeting with his Chicago Democrat cronies and wants them to bail him out. Last Friday, the mayor held a 2.5-hour meeting with the Illinois House Speaker Michael Madigan and Senate President John Cullerton, both Chicago Democrats, to outline the magnitude of the problem and propose solutions. 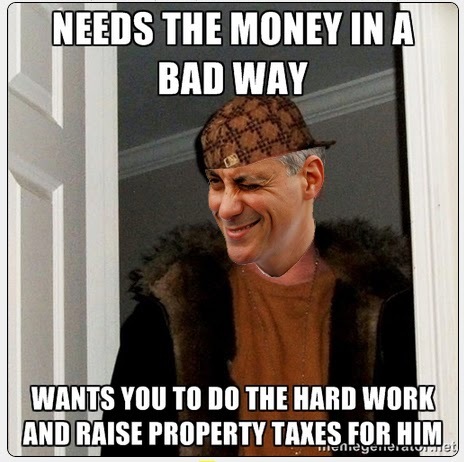 Emanuel wants the General Assembly to impose annual property tax increases on Chicago homeowners and businesses, but put off the balloon payment to shore up police and fire pensions until 2023 to make the bitter pill easier to swallow. He wants a General Assembly that has already solved the Chicago Park District’s pension problems to use that plan as a road map for other city unions. And he wants lawmakers to impose the same pension reforms on Chicago teachers that they did on teachers in the suburbs and Downstate. Really? When the going gets tough, the tough ask others to do their hard work?